It’s probably slipped your mind, but today is, in fact, National Siblings Day in the United States. We’re sure you’re just thrilled. Siblings can be your best friends, worst enemies, or somewhere in between. These Cane Creek “Perfect Pairs” won’t annoy, interfere, criticize, make snide remarks, borrow your clothes, monopolize the bathroom, leave the toilet seat up, or get in the way… In fact, with them you’ll share a mutual unconditional love, and we promise they’ll be there for you when you need them most. eeBrakes El Platino are limited edition and only available until April 19, 2019. Take advantage of this perfect pair before they disappear forever. Now your entire bike family can be matchy-matchy! Take your “twinning” to the next level by adding a colored HELM sticker kit to your order. Sticker kits are available in blue, green, orange, pink, stealth matte black, and stealth gloss black and will apply easily on any HELM fork, even the brand new HELM Works Series 130 (even though it has a larger, die-cut sticker). At first glance, this may seem an unlikely pair. However eeSilk premium suspension seatpost and Hellbender 70 headset have one major quality in common: They disappear. The very best components are the ones you never notice: they’re working flawlessly in the background providing you with reliable performance and unmatched confidence. eeSilk weighs only 295 grams and is comparable in weight to traditional rigid performance seatposts. It offers 20mm of vertical compliance, improving control on rough surfaces and reducing fatigue on long rides, allowing you to ride farther, longer far more comfortably. Hellbender 70 headset is a dream for cyclists, especially riders who like to get out in all conditions. The low-friction upper bearing seal completely seals the headset cup and sealed stainless-steel Hellbender bearing from contaminants (read: dirt, dust, road grime, sand, spiders, etc.) and is fully captured by the top cover with no loose parts. The Hellbender 70 gives you the design characteristics, sealing elements, and quality bearing found on a 110-series headset at a more palatable price. This one’s a no-brainer. Cane Creek’s patented Climb Switch technology has changed the way riders think about suspension. No other shock on the market offers climbing-specific damping for both compression and rebound. Keeping suspension active while climbing results in better connection to the trail and increased efficiency without annoying pedal-bob. When Climb Switch technology was introducted to Double Barrel IL shocks, we knew we needed an OPTion for remote control over compression damping… see what we did there? Enter: Opt. Opt is the Climb Switch handlebar remote that gives riders the option to tune their Climb Switch to their desired riding preference without their hands ever having to leave the handlebars. DB IL shocks and Opt go together like a more delicious version of peas and carrots… which would be like ice-cream and sprinkles. If you own a DBair IL or DBcoil IL, you need an Opt. Yes, need. Brent Graves, Cane Creek President & CEO, acknowledges, “The inspiration for the Road Cache came from [a rider’s] use of a ThudGlove to carry his spare tube and supplies.” The Road Cache is a minimalist, water resistant accessory pouch designed to fit in a jersey pocket. It has room to carry a 700×25 or smaller tube, tire levers and a CO2 inflator. Unlike competitors, the Road Cache is about less is more – it weighs less than a gel (only 27 grams!). The Road Cache is a clamshell design made of black neoprene with sturdy water-resistant zippers. While the Multi-Tool is neither minimalist, nor lightweight, and it definitely won’t fit inside the Road Cache with your repair equipment, it is an vital tool to carry with you on rides of any length. The tool comes equipped with 2mm, 2.5mm, 3mm, 4mm, 5mm, and 6mm allen wrenches, T25 “torx” wrench, and Phillips-head screwdriver. Additionally, and arguably most importantly, the integrated bottle-opener doubles as a spoke wrench and the corkscrew… opens a bottle of wine. All this with a beautiful wood finish – you can’t ask for much more! You have a mechanical, you aren’t carrying any repair equipment, but a good samaritan stops to help you with his/her own equipment. This is a six-pack+ or bottle of wine transaction. You have a mechanical, you are carrying your own repair equipment, and a good samaritan stops to help you get rolling again. This is a single beer or glass of wine transaction. Moral of the story: Buy a Road Cache and Cane Creek Multi-Tool and carry your own $h!t. The story of Catherine Dixon’s and Rachel Marsden’s attempt to be the fastest women to circumnavigate the globe on a tandem bicycle. Cat & Raz are the Tandem Women on Wheels. In early January 2019, Catherine (Cat) Dixon and Rachael (Raz) Marsden received notification that their world record challenge had been accepted by the Guinness World Records. Cat and Raz are working to become the fastest women to circumnavigate the globe on a tandem bicycle. Cat and Raz are from the UK and are in their early 50s. They’ve both given up their jobs and will be unpaid for the duration of their trip. The women have been training hard, and they aim to start their world record attempt in June 2019. They will be cycling 18,000 miles unaided, traveling through five continents, 23 different countries, and crossing the equator twice… all while mostly sleeping and caring for themselves in a primitive camp set-up. The women aren’t strangers to complex logistics and hard work, sometimes with limited resources: Cat is an ex-army officer currently running one of the largest land-based colleges in the UK which specializes in outdoor education. Cat has also been the CEO of the Law Society and a CEO in the NHS (National Health Service. A lawyer by profession, Cat has also spent time out of the office working as an outward bound instructor in Canada. Cat volunteers for a number of charities as a trustee and believes that the trip can be used to support a small number of dedicated charities and to raise the profile of women’s cycling. Raz has spent her career in the NHS. She is an expert in the management of complex disability and coordinates the specialist Motor Neurone Disease service in Oxford and has published books focused on improving the lives of her patients. With Dutch genes she has cycled all her life. Rachael wants to use the trip to show women that anything is possible. After a brief chat, we were thrilled to jump in to support Cat and Raz on their journey. For the entirety of their challenge, Cat will be steering with a Viscoset steering-damping headset and Raz’s rear-end will be far more comfortable on her Thudbuster ST suspension seatpost. We’re proud to support these powerful and courageous women. As part of their efforts, Cat & Raz are aiming to raise £10,000 for Motor Neurone Disease Association and Oxfam. If you would like to contribute, visit their donation page. We’ll continue to follow Cat and Raz throughout their journey, and you can too! Visit them at tandemwow.com, @tandemwow, Facebook, and Twitter. In the mid-nineties I got wind of a super cool product. At the time cranks were either forged (good) or cast aluminum (usually acceptable) from Japanese suppliers Shimano or Sugino. Then the CNC mini-boom hit and we were inundated with American CNC machined aluminum parts including cranks. However, as cool as many looked, and as light as many were, many of the CNC cranks would break. In the middle of this was a tubular steel crank with some unique features. It was not the first tubular steel crank, BMXers can tell you about Redline, Profile, Cook Bros and Bullseye cranks from the decade prior. However, this unconventional steel crank was developed for multi-geared mountain and road bikes. The cranks were called Sweet Wings. That the Sweet Wings were competitive weight-wise despite being made out of steel was a surprise. That they were much stronger and stiffer was not a surprise. The Sweet Wings also offered up some novel features. 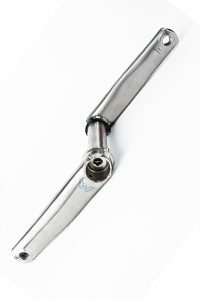 With nearly all mountain bike and road bike cranks using a 3-piece design, the Sweet Wings had just left and right arms with partial spindles and instead of attaching arms onto a four-sided taper, the left and right arms were attached with a splined interface that was held together with an axial bolt. How the Sweet Wings interfaced with the frame was also different. One bearing resided inside the bottom bracket of the frame, while the other was outboard. Lastly, the wild looking spider was actually individual arms welded onto the spindle. Many of those features (outboard bearings, non-tapered spindle, axial spindle bolt) are found on many popular performance cranks 20+ years later. Sweet Wings were a shooting star. They were the talk of the mountain bike world for a while and even ended up under 5-time Tour de France champion Miguel Indurain. However, technical issues in manufacturing and disagreements between the partners caused Sweet Wings to disappear as fast as they appeared. The fundamental concept never left the designer’s mind, and his heart yearned for many years to do an even better crank. His profession in architecture kept him busy enough, but he still found time to design some mind-bending brakes (eeBrakes) for road bikes and continue toying with crank designs. Once we connected with Craig Edwards and began making and selling his eeBrakes, it was only natural that the subject of cranks would come up. We then worked together to make his tubular titanium crank concept a reality. It took over eighteen months to design, test, validate, open tooling, and begin production. It was not a smooth path, but we learned a ton and ended up with what we feel is the best mountain bike crank in the world. In homage to the Sweet Wings, the new crank was named eeWings. Despite the visual similarities, eeWings are a completely new design and share nothing more with Sweet Wings than being TIG welded tubular structures. As mentioned above, Sweet Wings were steel. eeWings are made of two titanium alloys. Sweet Wings used a splined spindle interface, whereas eeWings use a Hirth joint. Sweet Wings had a welded-on spider, eeWings use a bolt-on spider or direct mount chain ring. eeWings have a 30mm titanium spindle compared to the smaller 24mm steel spindle of the Sweet Wings. eeWings also have an integrated bearing preload adjuster and fit numerous bottom bracket styles in addition to the threaded BSA the Sweet Wings fit. And while comparable in strength and stiffness, the eeWings are about 20% lighter and are impervious to corrosion. But in the end Sweet Wings and eeWings are both designs that shook conventional design and delivered peerless results. We are super pleased to have had the chance to develop and bring to market such a unique product, and one that pays homage to a legendary design from twenty-five years ago. Chatter about reduced offset forks is nothing new. PinkBike, UK’s Mountain Bike Rider, Bike Radar, and others have been talking about it for years. So why is offset a hot topic right now? Fork offset is the measurement of how far the axle (dropouts) sit in front of the bicycle’s steering axis. Rather than pushing the dropout closer to or further away from the fork lowers, Cane Creek lengthens or reduces offset in the fork’s crown. Take a peek at the images below – you should be able to visually see what a difference 7 millimeters makes! (Standard offset – 51mm, reduced offset – 44mm). DOES FORK OFFSET REALLY MATTER? OR IS THIS THE BIKE INDUSTRY JUST TRYING TO SELL ME ON SOMETHING NEW? Fork offset definitely matters! Lengthening or reducing your fork offset may alter the steering of your bike, and Original Equipment Manufacturers are purposeful in designing frames that create a very specific ride quality. It’s important that frame geometry be considered holistically: when you make a change to one area, it will affect other areas (think: chainstay lengths, headtube angles, seat tube angles, etc – this Calfee article explains everything nicely). 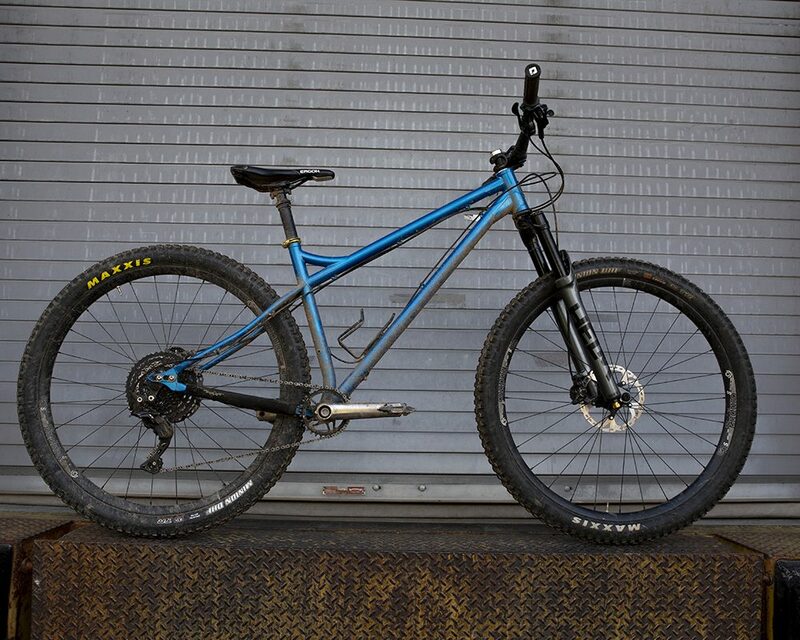 As fork offset decreases, your bike’s “trail” measurement increases, and vice versa. Overall, mountain bike geometries have gotten longer and slacker, which in turn provides increased rider stability, especially in steep and technical terrain. However, the longer the wheelbase, and the slacker the headtube angle, the lazier the bike handles, particularly noticeable in corners. A reduced, 44mm offset fork allows the rider to run a slacker geometry with a similar wheelbase, but still enjoy a stable steering platform without sacrificing traction, stability, and control. SO, DO I NEED A 44MM OFFSET FORK? 44mm offset isn’t necessarily “better,” but it could improve the handling of the front-end of your bike. Is slow steering bad? Is quick steering better? Is straight-line stability at high speeds desirable, even at the expense of responsive turning? It’s personal preference, it depends on your riding style and skill level, and we recommend considering how you feel on your bike and your desired ride quality. Do you experience “wheel flop”? Does your 29″ bike handle like a bulldozer through corners? Are you fighting against the front-end of your bike? All else staying equal, a change in HELM fork offset could be your solution. It’s important to note, some manufacturers are specifically designing frames around reduced offset forks (like Transition’s Speed Balanced Geometry), so offering HELM 29 Air and HELM 29 Coil in a reduced offset (44mm) allows riders a premium upgrade to Cane Creek suspension while maintaining the feel originally intended by product designers. WHAT ABOUT STANDARD 51MM OFFSET FORKS? GIVE IT TO ME STRAIGHT. Again, it’s all personal preference. Here’s the skinny: 51mm offset reduces “trail” and adds turning agility, while 44mm offset adds “trail” and adds straight-line stability, especially at high speeds. Even if you ride a bike designed for a 44mm offset fork, you won’t kill your ride experience or bike geometry by running a longer offset fork, and vice versa. But changing the fork offset on your bike will definitely change how it handles. Cane Creek is committed to offering products that allow each rider to fine tune his or her ride experience. Now HELM forks have yet another feature to help you make your ride your own. If you don’t feel confident making a decision between these two offsets for your bike or riding style, we recommend contacting your frame manufacturer for advice. We originally published: “Again, it’s all personal preference. Here’s the skinny: 44mm offset reduces “trail” and adds turning agility, while 51mm offset adds “trail” and adds straight-line stability, especially at high speeds. This was incorrect, and the article above has been edited to reflect this correct information: Here’s the skinny: 51mm offset reduces “trail” and adds turning agility, while 44mm offset adds “trail” and adds straight-line stability, especially at high speeds. Thank you to Noel at Knolly for bringing this to our attention. However, we maintain that it really comes down to personal preference and ride quality. What every article seems to dance around, yet what every reader wants to know is: How is this going to feel? There are a too many factors at play (fork length, wheelbase, tire choice, etc.) and considering bike geometry holistically is very important. 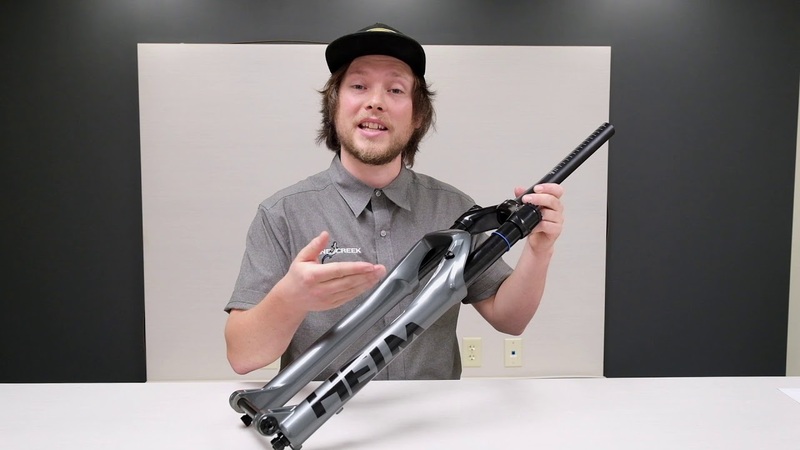 Our opinion is: a reduced offset fork may make your long and slack bike have improved handling, which feels “slower” at high speeds (less twitchy), with more stability and smoother handling. Santos Fat Tire Festival is one of the largest bicycle and gear expos in the Southeastern United States and draws the likes of major Original Equipment Manufacturers as Specialized, Giant + Liv, Santa Cruz + Juliana, Yeti, Ibis, Rocky Mountain, Norco, Pivot, and more. The event, located at the famous Santos Trails in Ocala, Florida, typically occurs the second weekend of March and has grown tremendously since its inception. In 2019, just under 5,000 vehicles entered the trail head over the course of the three-day event with an estimated 3,000 people in attendance each day. The expo is accompanied by organized group rides, skills clinics, and an Epic 50 mile mountain bike ride covering all the best trails Santos has to offer. You know you want to join in on the fun, join us at a Cane Creek Cycling Tour event near you! Visit our Facebook for the most up-to-date event information! At half the weight than that of its competitors, eeBrakes continue to set new standards by which all other high performance road brakes are judged. The same supreme upgrade for performance-oriented riders, a dramatically higher overall stiffness provides better modulation and more power. No detail has been overlooked, greater tire clearance and tool-less pad centering make installation simple. It’s a win-win! Direct mount weights are 78.2 grams (rear) and 78.4 grams (front) and regular mount weights are 83.7 grams (rear) and 85.3 grams (front), without brake pads. The AER headset has long been recognized as the world’s lightest headset weighing in at 49 grams. The new AER now offers a hybrid steel and aluminum bearing that provides even greater durability and a 40% weight savings over comparable models. Strategic machining and precision contours provide an optimal balance between weight savings and strength. Ideal for both road and mountain bike applications, AER is high quality, durable, lightweight, and has unrivaled performance. For an ultralight “Race Day” application, road riders can outfit their AER with a Norglide composite bearing. It’s the little things… eeNut Preload Assembly is only 10 grams (! ), 30 grams lighter than a comparable carbon steerer preload. The eeNut is a unique and patent pending design providing ultra light weight, solid locking action and ease of installation in one package. The recessed cone shape provides greater tension stiffness. This increased stiffness facilitates precise headset adjustment and sets it apart from other lightweight caps. Ounces equal pounds, pounds equal pain… sweat the small things. Did you know? You can lose up to 220 grams (.48 lb!) on your brake set and headset when you match eeNut Preload Assembly, eeBrake front & rear, and AER headset and bearings? eeWings premium titanium cranks are available in road, gravel, cyclocross, and mountain biking configurations, with or without Stages power meter. eeWings are engineered and handcrafted to withstand the rigors of aggressive mountain biking, but are a great premium upgrade for any cyclists who puts a premium on durability, stiffness, and weight. Both All-Road and Mountain eeWings titanium cranks weigh at or just under 400 grams. While their weight is on par with premium carbon cranks, eeWings’ durability and stiffness far out-perform them: eeWings are 20-30% stiffer than carbon cranks, which provides a stable, powerful platform for pedaling and executing technical maneuvers. They’re backed by a 30 day satisfaction guarantee and 10 year limited warranty, but we tend to think they’ll be the last cranks you may ever have to buy. DBair IL is our lightest weight air shock (~400 grams, without hardware), and it’s offered in a cornucopia of sizes in order to fit many full-suspension mountain bikes as a premium upgrade. As with all of our rear shocks, DBair IL is built to order by hand in our facility in Western North Carolina. With the DBair IL, you get to take advantage of Cane Creek’s Double Barrel twin-tube technology in an inline body. The DBair IL is packed full of features including Climb Switch technology and independent high-speed and low-speed compression and rebound adjustments. Competitive in weight but first in adjustability, the DBair IL is the perfect rear shock for the rider looking for a light-but-mighty shock package with unmatched tunability. Ahhhh, but if you prefer the performance of a coil shock, we’ve still got something for you: DBcoil IL with VALT spring. For years riders have had to sacrifice carrying the weight of a coil shock in order to get the performance and consistency they desired. The DBcoil IL is the first ever twin-tube inline shock that packs in all of the function of a piggyback coil shock in a lighter (*333g difference) and sleeker package. The shock alone weighs in at roughly 285 grams (depending on size), and the VALT spring offers significant weight reduction over our standard steel spring. Also equipped with Climb Switch technology, 4-way adjustability and unparalleled Double Barrel performance, the DBcoil IL dominates aggressive descents with superior small bump compliance, heat dissipation and linear spring action. * (216×63) DBCOIL IL with VALT® as compared to a DBCoil CS with a standard spring. Keep your handlebars light and neat with Cane Creek’s new eeBarKeep bar end plugs (6 grams each). Metal bar end plugs means your handlebar tape, grips, and/or bar ends stay neat, clean, and pro for a long time, rather than scuffing, tearing, or falling out. Designed with both flat and drop bar applications in mind these CNC machined, high quality components build upon the ee experience: precision, ingenuity and the love of the ride.